(Nanowerk News) Researchers from RMIT University in Melbourne have helped crack the code to ultra-secure telecommunications of the future in an international research project that could also expedite the advent of quantum computing. A team co-led by RMIT MicroNano Research Facility Director Professor David Moss has added a new twist to create photon pairs that fit on a tiny computer chip. The breakthrough, published in Nature Communications ("Cross-polarized photon-pair generation and bi-chromatically pumped optical parametric oscillation on a chip"), heralds the next-generation of integrated quantum optical technology, being compatible with current technology and secure communications. 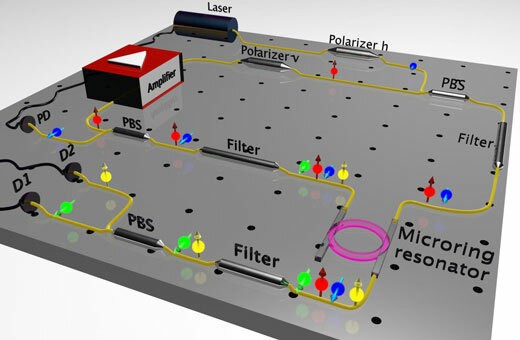 The team pioneered a new approach based on a micro-ring resonator - a tiny optical cavity - in which energy conservation constraints can be exploited to suppress classical effects while amplifying quantum processes. They used laser beams at different wavelengths and then had to overcome the risk of the two pump beams being able to destroy the photons' fragile quantum state. "One of the properties of light exploited within quantum optics is 'photon polarization', which is essentially the direction in which the electric field associated with the photon oscillates,'' Moss said. Moss worked with Professor Roberto Morandotti at the INRS-EMT in Canada and researchers from the University of Sussex and Herriot Watt University, City University of Hong Kong, and the Xi'an Institute in Chin, on the research. "While a similar suppression of classical effects has been observed in gas vapours and complex micro-structured fibres, this is the first time it has been reported on a chip, opening a route for building scalable integrated devices that exploit the mixing of polarization on a single photon level,'' he said. "It also has the advantage that the fabrication process of the chip is compatible with that currently used for electronic chips which not only allows the exploitation of the huge global infrastructure of CMOS foundries, but will ultimately offer the potential to integrate electronic devices on the same chip.